Facebook Creep Teaches me a Good Business Lesson – 4 Tips You Can Use! Hello my dear, good evening to you from here, how is life with you over there, what a nice and sparkling smile you have on your pretty face, actually I was looking for an old friend of mine in Facebook and I came across your profile, I got entangled in that wonderful smile, I couldn’t pass by but to express how I feel and I care about it, I could not take my eyes off such a beautiful lady, that is why I am saying hello. Please always wear this smile, no woman has ever caught my heart so deeply as you do, if you don’t mind can I be your friend, hope to hear from you soon. When I didn’t answer in 20 seconds, he messaged me again asking if I was there. But this got me thinking – I tend to want to do this in my business! Ok well not the creepy compliments and stalker-ish feel, but when I see someone I know I can help, I instantly want to pitch them what I can do and how I can best serve them to success. I don’t hold back. I really started thinking about how I am perceived with prospective clients that I connect with on Facebook and social media in general. How are you perceived by prospective clients you connect with on social media? People need to get to know you first. They need to realize, on their own terms, that you are worth their time. How do you facilitate that process? Why social media of course! Here are 4 ways you can be a blockbuster success while still approaching people in the right way, not in the creeper-I-want-to-sell-you-something way. 1. Be a real person, not an auto-bot. By that I mean, get on your favorite platform and start posting real time, real life good stuff that actually happens to you. Be real and authentic. 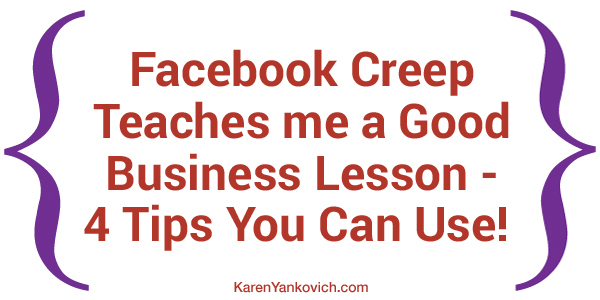 Talk about the trials and tribulations of being a business owner, talk about what you believe in, talk about the funny things that happen to you in your day (ie Facebook creeper who actually taught me something!). We are drawn to people who are real and you would be surprised the people who show up with you decide to drop a bit of the veil and go for it. 2. Strike up a conversation with someone who is saying something you love, talking about a topic you are interested in, or just being real (see #1 above). Spend some time getting to know them and how you can help vs how they could help (ie Facebook creeper guy was all about making ME do something to make HIM happy) Genuine interest in how you can help someone is generally perceived as… Genuine Interest! 3. Write about who you are and what you do so people can find it and read it at their leisure. This means regularly blogging on your website, LinkedIn long form posts, Tumblr, or whatever platform floats your boat. Show up, be consistent, and give a lot of value for free. All of this builds trust and trust is what turns you from being a “salesy-pitch” into a “caring offer of help”. 4. Foray into real time video and conversations via Periscope and Blab. (Check out my blogs on each of those platforms here and here) While these two platforms are different, both of them allow for you to show up as who you are, interact with people interested in what you have to say, and find new ways to connect and give value to your prospect clients. No big pitch or creepy vibe, it’s just you and a video and a chat stream, or you and a few other guests talking about something important. Show up in real time and get the benefits of an audience that has now seen you (possibly in your pjs), heard you (possibly with a beer in your hand) and starts to really like you because you speak to who they are as well. Enter with social media, exit with trust. It honestly doesn’t take a lot, it just takes a little bit of bravery (to put yourself out there) and compassion (to really want to help). The rest will come. What do you think of my Facebook creeper? Have you dealt with one before? Don’t swear off social media, just swear to make it better for those you choose to connect with. Need help figuring out what to say? Want to construct a template for introducing yourself on all different social media platforms? Join me in my LinkedIn group and we will figure this all out together! This sounds wonderful,I’m excitedabout attending your webinar perhaps I will pick up some more wonderful tips. This article goes to prove that you can never know where inspiration will come from! Oh yeah – his come-on was a little icky. I have to wonder how many other lovely ladies with a nice smile got the message – not taking anything away from you Karen ! Good points about being ‘real’ and interacting. Karen, I love the idea of being real and in the moment on social media. I think as professional helpers, we expect to be formal and worry-free at all times. You point out that you can be a human being and helpful, all at the same time.